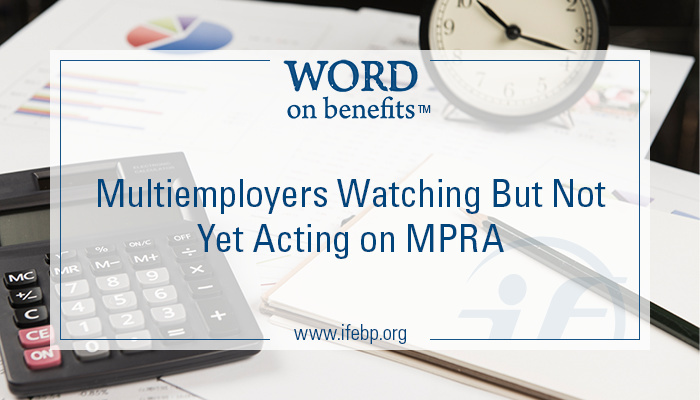 Multiemployer funds are closely monitoring and discussing in detail the Multiemployer Pension Reform Act of 2014 (MPRA), but the majority of funds responding to our recent survey do not plan to take the more drastic measures MPRA allows. These findings and more are revealed in the International Foundation’s new report Impact of the Multiemployer Pension Reform Act: 2015 Survey Results. Allows PBGC to order and finance plan partitions. On May 7, 2015, roughly six months after the law passed, the International Foundation of Employee Benefit Plans deployed a brief survey to multiemployer funds across the United States to examine how multiemployer funds are following and understanding the recently enacted law, its anticipated impact and preliminary actions being considered. Of the 216 representatives who voluntarily completed the survey on behalf of their funds, more than two-thirds are trustees for their funds, while about one-quarter are fund administrators or administrative staff. Surveyed funds represent a wide variety of industries and range in size from fewer than 50 participants to more than 10,000. Key findings are in the infographic below. The International Foundation will keep you updated as the agencies in charge of administering MPRA collect comments and release further guidance. Watch our MPRA web page, the Today’s Headlines daily member e-newsletter and this blog for more news.